The Miniature Poodle is a lively, sensitive, playful, loyal, energetic, happy and loving dog who becomes attached not just to one person but to the entire family. He is a wonderful family companion who doesn't like to be left alone for hours. He is very human-oriented, and will turn mischievous and destructive if he is ignored or neglected. He's an extremely easy dog to train, and loves to learn tricks and games or participate in dog sports like agility or obedience. He is eager to please you and quick to learn. He has a remarkable way of seeming to understand your words and expressions and exactly what you want. He is playful and fun-loving, and likes to play fetch and chase balls. He's a very high energy dog with lots of stamina, and he needs a great deal of exercise. He can walk with you for miles, or run madly around the house or yard. He needs a daily walk as well as outdoor play. Without enough exercise, he can become high-strung or nervous. But if you play and work with him, he is able to settle and snuggle contentedly with you on the sofa. He has wonderful swimming abilities and loves to play and splash in water! He can occasionally be demanding or jealous, and is an instinctively protective dog. He makes an outstanding watchdog, as he will bark energetically at the approach of a stranger. He can sometimes bark too much. He is shy with visitors and new people, but generally gets along well with other animals and pets. A caring and generally calm and good-tempered friend, he can be patient and playful with children, but should be supervised with very young children, as he can become nervous and nippy around them. He virtually doesn't shed, and so would be a good pet if you like your home clean and free of hair. 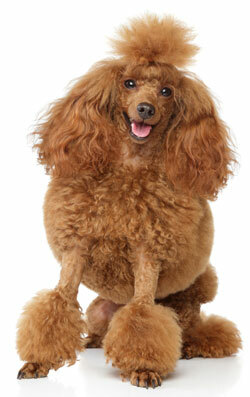 The Miniature Poodle is 11 to 15 inches tall (to shoulders) and weighs 15 to 17 pounds. He has a long, soft, curly coat. His coat color is usually solid, in white, black, apricot or gray. Pet coat: His coat only needs to be brushed occasionally, and clipped short every few months. Show coat: Brushed for 10 to 15 minutes daily to prevent tangling and matting, and clipped short and scissored into shape every 6 weeks. The Poodle's origins are uncertain, but what is known is that all Poodles, whether Toy, Miniature, or Standard, descend from the larger (Standard) breed. He was probably developed in either France or Germany. Although he is the national dog of France, his name comes from the German word "pudelin," which means "to splash in water." He was originally developed as a water retriever, and later also hunted truffles and performed on stage and in circuses. He was known throughout Europe by the 15th and 16th centuries, his image recorded by artists including Durer and Goya. He was a special favorite during the reign of King Louis XVI, and has remained an enormously popular breed in the centuries since. His AKC popularity was 8th out of 157 breeds in 2007.